The Quire was the first part of St George’s Chapel to be completed. The Quire and its aisles were finished and roofed between 1477 and 1483. Originally composed of fifty stalls for the Knights and Canons, twenty one faced each other with the remaining eight ‘returned stalls’ placed at the west end facing the altar. In the late eighteenth century two further stalls were added taking the number to fifty two. The Quire contains many points of interest some of which as illustrated below. See the Quire virtual tour fullscreen (link opens in a new window). 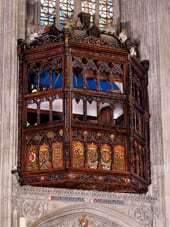 King Henry VIII created this oriel window in the chantry chapel of Edward IV so that services held in the Quire could be viewed by his first wife Katherine of Aragon. Queen Victoria frequently used this window for regular services when at Windsor. The adjacent picture shows the Edward IV Chapel. The Sovereign’s Stall was carved by William Berkeley c.1478-1485 with the addition of the canopy by Henry Emlyn in 1787. Below the seat is an outstanding fifteenth century misericord commemorating the conclusion of the Treaty of Picquigny in 1475. 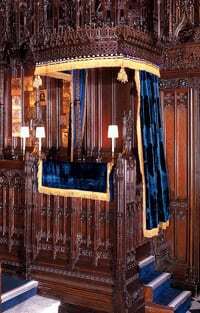 When the Monarch bestows the Order of the Garter, a stall is provided for the Knight or Lady for the duration of their life. 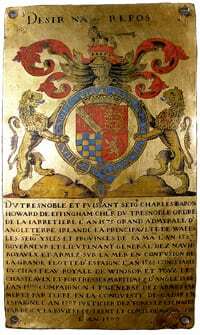 A Stall Plate is fixed to the back of the stall and this illustrates the Arms and titles of the Knight or Lady. This Plate remains in place after their death and has resulted in the impressive and important display that we see today. 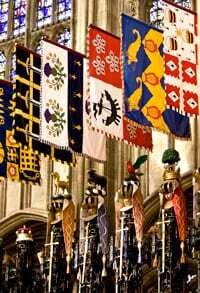 Above each Garter Stall is the banner and crest of that Garter Knight. Some banner designs have been passed down over generations and others are new grants. The crest is mounted on a helm. 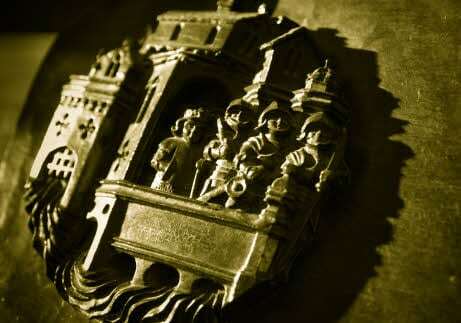 Many of the crests, and sometimes the coat of arms, make use of a visual pun relating back to the Knight’s achievements or background. 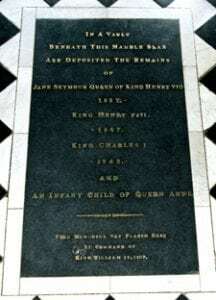 In the centre of the Quire is the ledger stone marking the burial place of King Henry VIII and King Charles I. Jane Seymour, one of the Queens of King Henry VIII is also buried here. This chamber was discovered during restoration works in 1837 during the reign of King William IV who instructed that a stone mark the spot.